First I would like to wish everyone a very Happy Easter. This week was a quiet week for me craft wise on the most part because I was finally getting over my cold I had. But I did work on a few things. I made carrot treat boxes for Easter I filled them with little snack size candies and tootsie rolls and one has a match box car inside. My family loved the carrots, my mother dumped out her candy and will keep hers on display in her china cabinet. 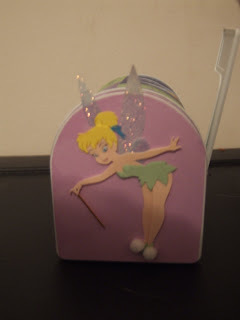 I made my sister an altered mailbox of Tinker Bell that she has been begging for. For my Ta Do's this week I hope to get a lot more accomplished then I have in the past week or two. 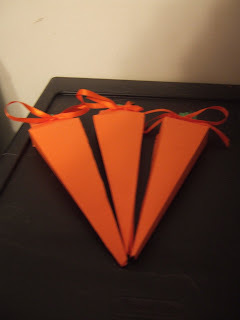 This week's bonus question: For which holiday do you do the most crafts? (Examples would be great!) I would have to say Christmas. I make cards for every occasion (birthday, Easter, Halloween etc.) but for Christmas I make cards and gifts. This past year I made all handmade gifts no store bought items. I am tired of going to the store and they have the same ole same old. This past year I made name frames, aryalic post it note holder, mini calender, altered paint cans and inside were bath items, coasters, and magnets. Wow, that's a lot of neat stuff! And such great ideas and beautiful work! Happy Easter! Wow!!! You're just a creative machine sometimes, eh??!! 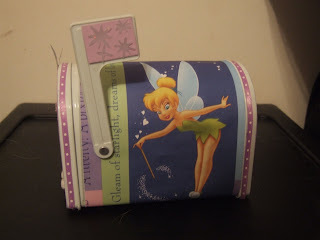 LOL I just LOVE the Tinkerbell mailbox!!! Glad you're feeling a little better!!! Have a beautiful Sunday!! All your craft is wonderful, the mailbox is gorgoeus. Your post it note holder is wonderful too. I love your stuff! I really love the candles and the coasters, were they hard to do? Thank you for visiting my blog and leaving a comment. You have a lovely blog and your projects are adorable. Cute projects. Don't love those carrots!! I love those mailboxes of yours I just can't get mine to look like something I can say YESSS like yours! !